A local tea-tree found chiefly along dry watercourses, it forms a small bushy tree to 8 m tall. This hardy plant has small narrow leaves to about 1.5 cm long with a fine point. The white to cream, flowers are in spikes 3-9 cm long, initially at the ends of branches, but, then the apex continues growing so that the woody seed capsules (about 3 mm diameter), are no longer at the tip. 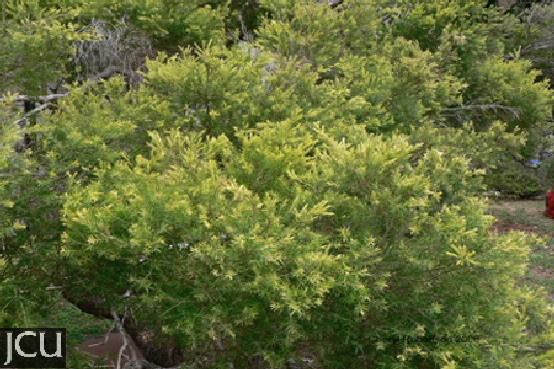 The compact shrub with yellowish-green leaves is the cultivar ’Golden gem’ (illustrated).